A variety of faith-based organizations began helping schools in the Scappoose School District earlier this year, after Interim Superintendent Paul Peterson suggested forming a partnership. In some ways, the partnership allowed pastors and other faith leaders to learn more about one another, and it has also brought school administrators and community volunteers together. has been one of the beneficiaries. "We have quite a few projects we are hoping to tackle with our school community and with two of our faith-based partners," Grant Watts Principal Jen Stearns noted in an email, referring to partnerships she's forged with Grace Lutheran Church and Scappoose Foursquare Church. 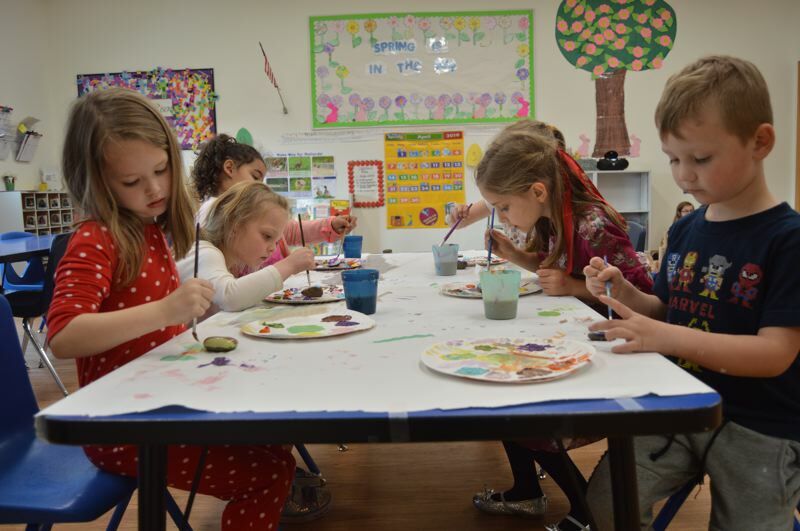 Cindy Overstreet, director of the Grace Christian Children's Center, a child care facility housed at Grace Lutheran, said the partnership has provided them with an easy way to give back and connect with the local school. Many of the students in the childcare program attend Grant Watts, so it made sense to connect. "It's great to help others and to support the local community. Everybody needs a little support from other people," Overstreet said. "The reward you get is the feeling you get for helping somebody." Currently, they are working on reviving a "kindness stream" art project at the school. Students at the childcare are helping repaint river rocks that will be arranged in an art display on campus. The art feature was installed previously by others at the school, but the paint didn't hold up to the elements. Overstreet offered to purchase specialty outdoor paint and shellac to make sure the rocks would be protected. "We thought that's a perfect one for us, so we can have kids at the table painting rocks all day long," Overstreet said. When Stearns first brought the rocks over to Grace Lutheran Church, there were about three five-gallon buckets of rocks to repaint. Today, there's probably half of a bucket of rocks remaining. Each day, staff would lay out butcher paper to cover the tables, get out paint brushes and paint, and let the students work on a handful of rocks at a time. "This is the whole idea. People helping each other. With these big projects its easier to do," Overstreet said. "You know, it's not one person painting five million rocks by themselves." While the project is in good hands with Overstreet and her volunteers, Stearns said there are numerous other projects to tackle at the school with the help of other volunteers like Daniel Schmoll from Scappoose Foursquare Church. Some of those projects include setting up a lending library and community area near the school's kindergarten wing, laying bark chips on the school's jogging path, and installing signs that support mindfulness and fitness, painting support beams to look like giant crayons, and general weeding and landscaping needs. Later this month, the school will be hosting its third annual campus cleanup day from 3-6 p.m. on Monday, April 22. In addition to relying on faith-based partners, Stearns is hoping families and students will help chip in after school to help as well. "We will have a hot dog barbecue as a culminating activity at the end of our event. We want to celebrate the commitment the families and community are making to better Grant Watts," Stearns stated in an email. "It is a special learning community and we are invested in making it better each day."